O2 By OGX... - Sleek For Yourself! O2 By OGX... | Sleek For Yourself! Everybody...I have amazing news. You might want to sit down. I have found THEE best shampoo and conditioner that I have ever used. Now you may remember a while back that I worked alongside OGX who sent me a selection of goodies from their Biotin and Collagen collection. They had sent me that collection specifically because of my hair type. 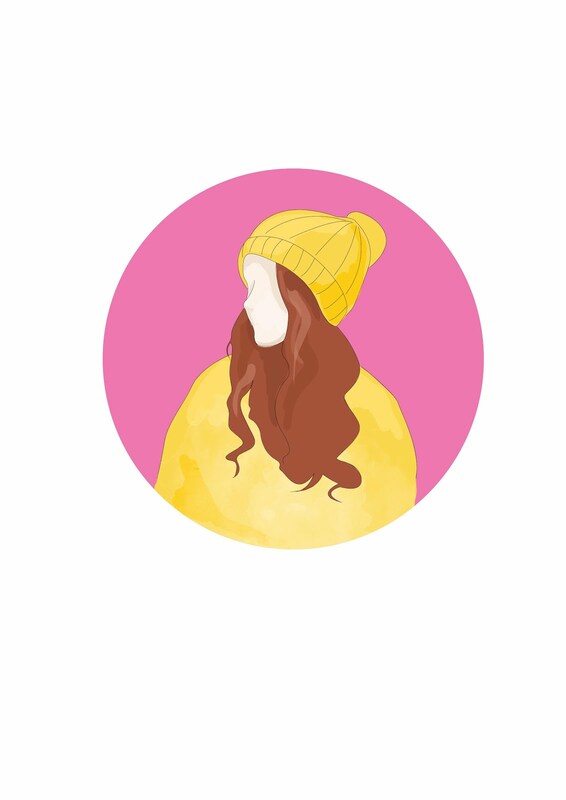 I have very limp, thin, dry but easily greasy hair which has split ends, colour damage and heat damage. So basically my hair needed some tender loving care. And that is what the Biotin and Collagen gave me. I noticed a difference quite quickly but the longer I used it the more benefits I started to notice. 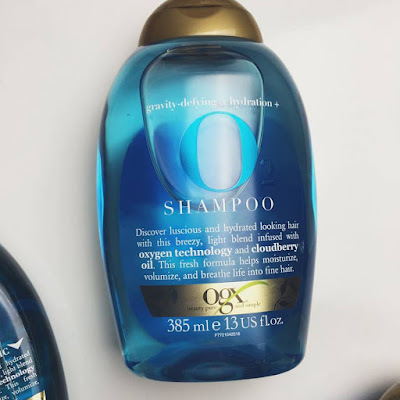 It definitely improved the quality of my hair and I immediately became a fan of OGX products but I was keen to try more. I was very very happy indeed because as soon as I opened the envelope the scent hit me and I died and went to a shampoo and conditioner induced heaven. Seriously. This was a completely unexpected parcel which is always such a lovely surprise. I LOVE when brands do that!! I emptied the contents onto my living room floor and inside I found the O2 collection which includes a shampoo, conditioner and an oil mist spray. 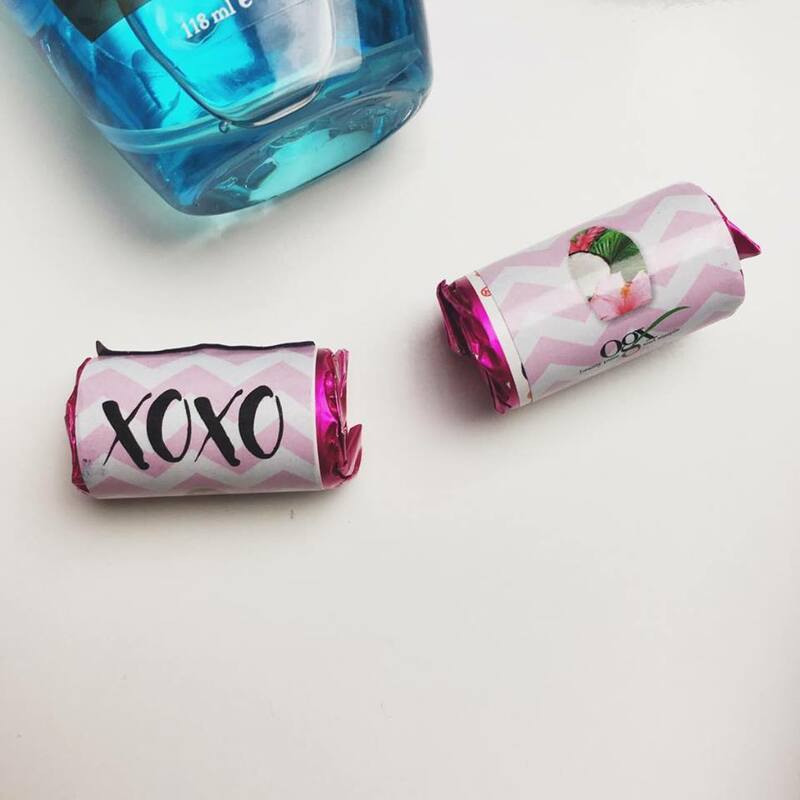 They had also included two little personalised OGX packets of Love Hearts. Those little added touches make your experience with a brand even more memorable. What a sweet touch. See what I did there? 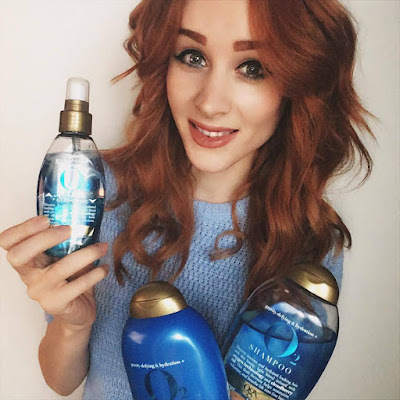 The first thing I do when getting new hair products is smell them because if you don't like the smell you don't really want to drown your hair in it so I do believe that's an important factor and a lot of peoples decision maker when buying shampoo. This is 100% the best smelling shampoo and conditioner I have EVER smelt in my entire life. I think I sat for about 10 minutes with my nose so far into the bottle the lid was starting to permanently dent my nose. I just wanted to sit and smell it forever so I was super excited to start using it. The next thing I did was actually sit and read about the collection to find out what this scent-sational smell was! It's a fruit, it's golden-yellow, super juicy and full of Vitamin C. Looks a bit like a yellow raspberry. I do like raspberries and I do like vitamin C. Sounds good to me so far. Well it's for people like me. People with fine, thin, not so voluminous hair. 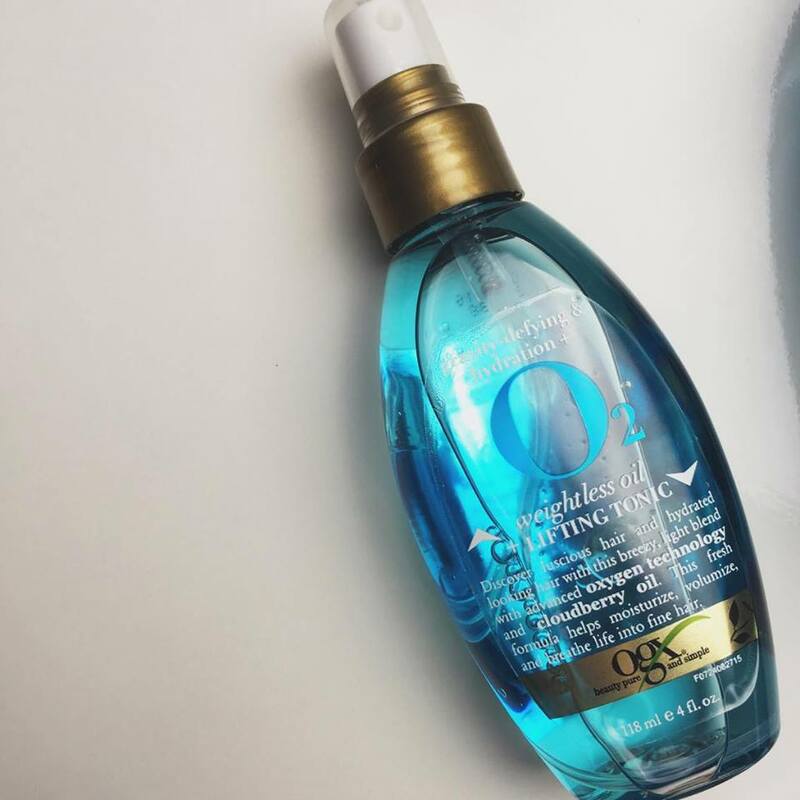 Infused with oxygen and cloudberry oil it lifts and hydrates without stripping the hair of moisture. Perfect, because that's exactly what I needed. Apparently it has been inspired by skincare technology trends which is exciting to know they are trying something new. Oxygen liposomes put oxygen into the hair strands and the cloudberry gives a form of Vitamins A, C, B and E and also magnesium and antioxidants. Well it all sounds great to me and the desired result is an extremely lightweight feeling of fuller and super swishy hair. Well. I tried it the next day. The first thing I noticed was that the bottles have been made slightly thinner. THANK THE LORD. If you read my last blog post about OGX I mentioned that I found the bottles just a little tiny bit too wide for my petite little hands and therefore it was difficult for me to muster the strength to get the product out. Now I don't have that issue and it fits perfectly in my hand but still has that funky unique shape that makes the OGX bottles so recognisable! I wonder if a lot of people had that problem or if they work on the feedback of blogger reviews? That's the beauty of blogging, it gives you the chance to tell a brand what they could improve because then they do it and everyone is a winner. They get advice off a customer and we get to help out! I next noticed the texture of the shampoo. Thick yet not too thick that it's heavy and doesn't lather. It's a jelly like consistency and lathers beautifully. Probably one of the, if not the best shampoo that I have used 'lathering-wise'. 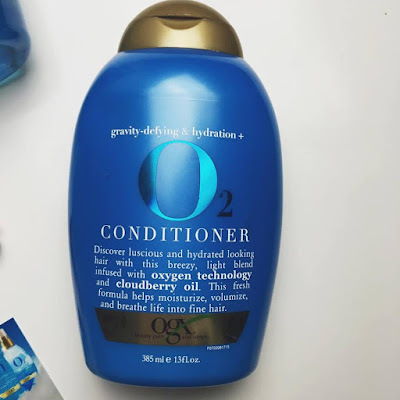 I find sometimes you have to wash twice with certain shampoos to get a good lather but this worked with one wash which means the product will last longer. My other bottle of OGX lasted ages which makes paying slightly more for a higher end shampoo and conditioner worth it! The conditioner is also a lovely texture. Very lightweight yet creamy. As soon as it touched my hair I knew I was going to get that amazing feeling you get when washing out a conditioner and you feel like a goddess? You know the one! It literally made me hair feel like silk. Not only when washing it out, but whilst applying it. I specifically remember shouting 'oh my godddddddddddd' and Elliot asking from the other room if everything was OK. So far I absolutely adored this set. It's not very often that applying a shampoo or conditioner is an enjoyable experience but I actually felt like I was pampering myself and giving my hair a treat rather than just washing it. I just adore OGX products. I tried the oil and lifting tonic afterwards and it's one of those super cool ones with the two separate colours that you have to shake to activate. I found myself putting a lot on then immediately regretting it because I could guarantee that I would wake up with super greasy looking hair. Not at all, it was soft and glossy. Not oily. Glossy. I was interested when I found out the one layer is oil and the other is hairspray. This not only hydrates but holds to create volume! How clever. One thing I must mention in case anyone else has had the same problem...I still have my biotin and collagen oil mist and I picked it up the other day and noticed it had completely crystallised. Like frozen. I said to Elliot 'It must be too cold in here' and he thought maybe I hadn't moved it around enough and it had dried up. But I put it in the bathroom where it's a bit warmer and an hour later it was completely normal again. So if you use the oil mist and it freezes don't throw it away thinking it's ruined. It's just cold and needs a hug. Some great things that really made me super happy about this O2 collection and what really made it so so amazing is that I noticed on the conditioner bottle that it is SLS free. One of my 'things' about 2017 was that I wanted to start using SLS and paraben free products. I'm not being super strict with it because I work with a lot of beauty brands but this was a little added bonus. It only says it on the conditioner bottle though so maybe that's something I should ask about. Now that you have heard my first impressions, you may be wondering what the results were like after using it for quite a while? Well. 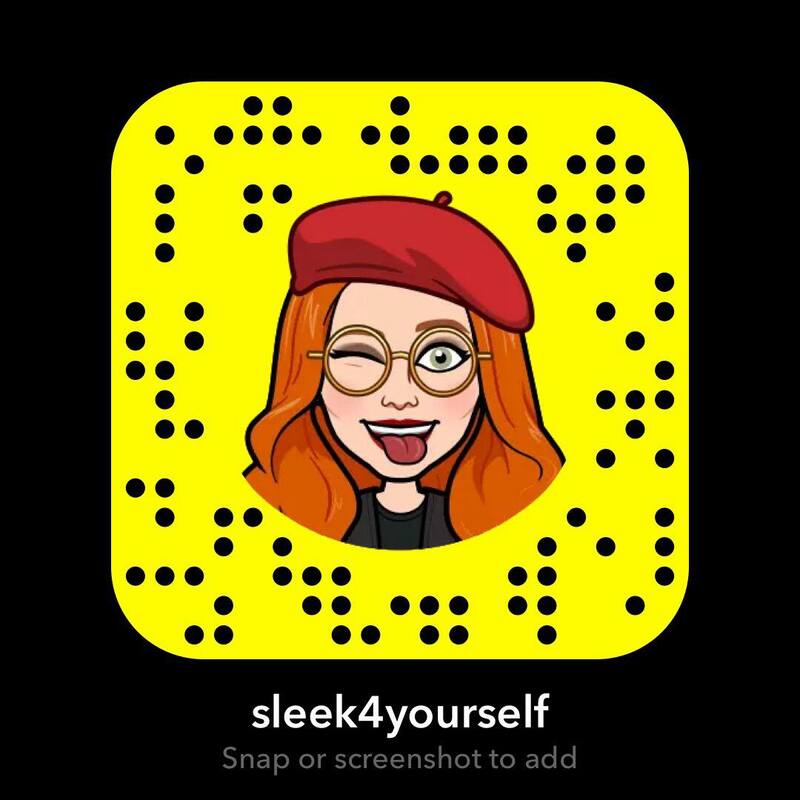 If you have me on snapchat (fbloggerstacie) you will already know. I have noticed a hugeeee difference. My hair feels so so thick and full of volume. It sits beautifully, it feels 'swishy' and just in better condition all round. I am seriously so impressed with these products. I will be recommending them to everyone and their aunt fanny. I noticed that so many more people are trying OGX recently and they really are working their way up the popularity ladder. It makes me so happy because I just love the brand. So many people are quickly making this a staple item in their hair washing collections. I have well and truly being converted and I have found an item out of their ranges that suits me perfectly. I was always a huge Aussie fan but although I do love their products, I will certainly be reaching for OGX first. I also think OGX do the best variety out of all the brands. 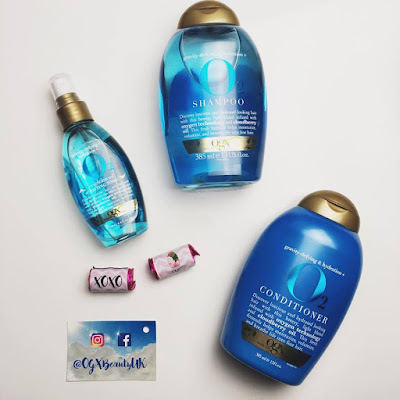 They have a hugeeeee collection so you can't use the excuse they don't have anything to suit your hair, There is something for everyone and they all have amazing effects. Take a look at the collection here and see which range you want to try! If you liked this post then be sure to read about the biotin and collagen collection here too! It's also amazing for volume! I was so impressed to learn that there are only two members of staff running the PR team. Jessica and Kay. They are doing such a great job! Well done girlies. Such a pleasure to work with! This range was launched in October 2016 so it's new and I highly recommend giving it a sniff next time you see it on the shelf to see why I love the smell so much. It is sold in Boots, Asda, Tesco, Sainsburys, Superdrug. Everywhere. You can't miss it. All the items in this range are £6.99. Thank you so much once again to the girls at OGX. You really have made my hair very very happy and my Christmas was great too thanks to your lovely parcel! I'm truly shocked at the difference in my hair condition. OGX really does work wonders. It's a miracle. A wonderful cloudberry infused miracle. Pick yourself up some AMAZING sunglasses! Disclaimer: These products were sent to me on a gifting basis as a press release in exchange for a review. All words, pictures and opinions in this blogpost are my own and my 100% honest opinion. These products look amazing! I'm yet to try OGX but I might have to after reading this!